Theresa May's hopes of getting her Brexit deal through Parliament have been dealt a huge blow after her key allies, the Democratic Unionists, attacked her "inexcusable" failure to come back from Brussels with any improvements. Following late night talks in Brussels which saw European Union leaders take part in a mammoth eight-hour meeting, Theresa May obtained an agreement for the start of Brexit to be delayed until May 22, so long as she can secure support from the Commons for her deal. However, May 22 is far short of the June 30 the Prime Minister had initially requested. However, speaking of Friday, DUP deputy leader Nigel Dodds said the Prime Minister had failed to secure changes to her Brexit deal - including the Northern Ireland backstop - at the summit in Brussels, meaning his party would not support it in a Commons vote. 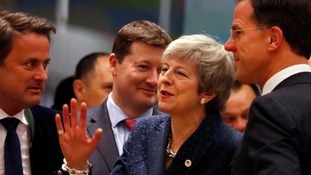 Late on Thursday night, the EU told Mrs May that if her deal is not passed, then she has until April 12 to come up with an alternative plan, with a longer extension on offer only if Britain takes part in European Parliament elections in May. Mrs May spent Friday making a last-ditch drive to persuade MPs to back her EU withdrawal plan, something which she seemingly won the approval of the European Union for, with European Council President Donald Tusk saying: "As the EU, we are prepared for the worst, but hope for the best. As you know, hope dies last." However, Mrs May's attempts to persuade MPs to back her deal in a third meaningful vote was dealt a blow on Friday after DUP deputy leader Nigel Dodds said the Prime Minister had failed to secure changes to her Brexit deal - including the Northern Ireland backstop - at the summit in Brussels, meaning his party would still not back it. "The Prime Minister missed an opportunity at the EU Council to put forward proposals which could have improved the prospects of an acceptable Withdrawal Agreement and help unite the country," Mr Dodds said. "That failure is all the more disappointing and inexcusable given the clear divisions and arguments which became evident amongst EU member states when faced with outcomes they don't like." He added: "Nothing has changed as far as the Withdrawal Agreement is concerned. "We will not accept any deal which poses a long-term risk to the constitutional and economic integrity of the United Kingdom." Also on Friday, ministers began moving to try to head off an attempt by MPs to seize control of Commons business in a bid to secure a "softer" Brexit. They were responding to claims by a cross-party group of pro-EU MPs who said they had the numbers to force a series of "indicative votes" on alternatives to Mrs May's Brexit deal. However, Business Secretary Greg Clark said the Government was prepared to enable Parliament to express a view on the various options if Mrs May's deal is rejected by the Commons for a third time next week. Meanwhile, Mrs May told MPs she would not bring her beleaguered plan before MPs for another vote next week if sufficient support cannot be mustered. In a letter to parliamentarians, she said: "If it appears that there is not sufficient support to bring the deal back next week, or the House rejects it again, we can ask for another extension before 12 April - but that will involve holding European Parliament elections. Mrs May also offered to hold talks on Brexit with any MPs who would like them, as she thanked those who have supported her deal in previous votes. Sir Oliver said: "We believe that we have the numbers to pass the amendment on Monday and thereby guarantee indicative votes on Wednesday." However Mr Clark pointed to a commitment by David Lidington, Mrs May's de facto deputy, to "facilitate" Parliament in expressing its view if she loses the third "meaningful vote" on her deal. "The Government will provide that so there is no reason why the Government should be forced to do something which it is committed to do anyway," he told the BBC. Asked if that meant Mrs May would give MPs indicative votes on the way forward, he said: "Yes." The prospect however infuriated Brexiteers who fear it could see the Commons pivot towards a "softer" Norway-style deal. Steve Baker, the deputy chairman of the European Research Group, tweeted: "National humiliation is imminent through these 'indicative votes'." On Friday, Mrs May returned to London from Brussels with her party in disarray and MPs openly speculating that she will be forced to quit. Following defeats by 230 votes in January and 149 votes last week, both pro-EU MPs and Brexiteers warned that she was heading for another heavy reverse in a vote on her deal. Should Mrs May lose another vote on her Brexit plan, that would "make her [Mrs May's] position very difficult", former education secretary Nicky Morgan said, adding "there is no doubt" Conservative MPs had made clear they wanted her to go. While Nigel Evans, the pro-Brexit executive secretary of the backbench 1922 Committee, said "a lot of people think it is not going to be long now before she does leave Downing Street". Backbencher Steve Double added that the next week would be a "defining moment" for Mrs May's premiership and urged her to consider her position. "I think it is quite clear that she is not leading her party. She is isolated, sadly, from a majority of the parliamentary party now," he said. "We need to find a way forward and I think that requires new leadership." "The world would finally decide that the British and their political system had gone mad if we all broke off to have six weeks of a b***** leadership campaign," he told BBC Radio 4's The World At One. Earlier, aides confirmed Thursday's agreement meant a no-deal Brexit was no longer a possibility on March 29, but stressed that it remained on the table if MPs have not approved the Withdrawal Agreement by April 12. The format increases pressure on Leave-backing MPs to row in behind Mrs May's deal, for fear that if it falls, the UK could find itself electing new MEPs and remaining for months or years within the EU. Downing Street was unable to say on which day the Government would seek to bring back the Withdrawal Agreement for a third "meaningful vote" - known in Westminster as MV3. Also on Friday, Labour leader Jeremy Corbyn was in Brussels to hold talks, where he said he had made it "very clear" that Mrs May did not have support for her deal in Westminster. "There is support for various alternative options, one of which we'll put which is a Customs Union with Europe and is about market access and protection of rights, consumer rights, environmental protections as well as workers' rights and that's what we're going to put," Mr Corbyn said as he outlined Labour's alternative. Labour's deputy leader Tom Watson is set to take centre stage on Saturday to declare that Britain can only begin to heal its bitter divisions if the people are given the final say on Brexit. Mr Watson will deliver a keynote address to the “Put it to the People March” in Parliament Square ahead of crucial decisions for MPs next week when Mrs May is expected to try a third time to get her Brexit deal over the line.